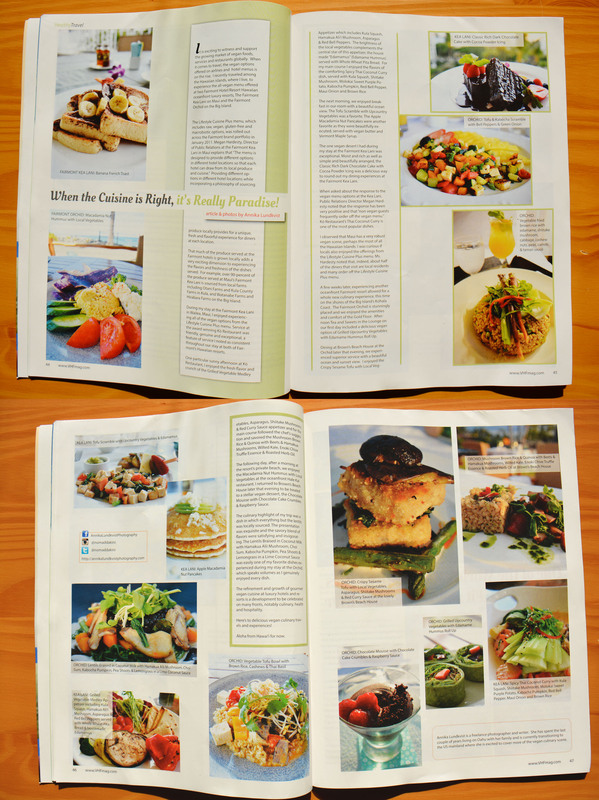 My coverage (article + photos) of the exclusively vegan menu at The Fairmont Kea Lani, Maui & The Fairmont Orchid, Hawaii as part of their ‘Lifestyle Cuisine Plus’ Menu appears in the July/August issue of Vegan Health & Fitness magazine! 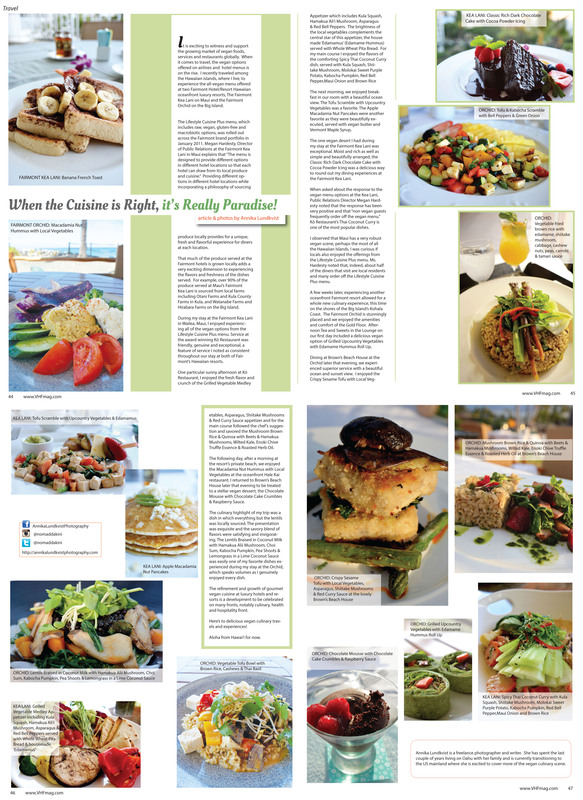 This is such a terrific magazine & I am excited to have contributed to this issue, particularly with this 4 page piece dedicated to the delicious vegan dishes of these two Hawai’i based resorts of Fairmont Hotels & Resorts. Additionally, this piece heralds a new Column for me so stay tuned for more! It is exciting to witness and support the growing market of vegan foods, services and restaurants globally. When it comes to travel, the vegan options offered on airlines and hotel menus is on the rise. I recently traveled inter-island to experience the exclusively vegan menu on offer at Fairmont Hotel and Resorts two Hawaiian oceanfront luxury resorts, The Fairmont Kea Lani on Maui and the Fairmont Orchid on the Big Island. The Lifestyle Cuisine Plus menu, which includes raw, vegan, gluten free and macrobiotic options, was rolled out across the Fairmont brand portfolio in January 2011. Megan Hardesty, Director of Public Relations at the Fairmont Kea Lani in Maui explains that “The menu is designed to provide different options in different hotel locations so each hotel can draw from its local produce and cuisine.” Providing different options in different hotel locations while incorporating a philosophy of sourcing produce locally provides for a unique, fresh and flavorful experience for diners at each location. That much of the produce served at the Fairmont hotels is grown locally adds a very exciting dimension to experiencing the flavors and freshness of the dishes served. For example, over 90% of the produce served at Maui’s Fairmont Kea Lani is sourced locally from farms including Otani Farms in Kula, Kula County Farms in Kula, Watanabe Farms and Hirabara Farms on the Big Island. 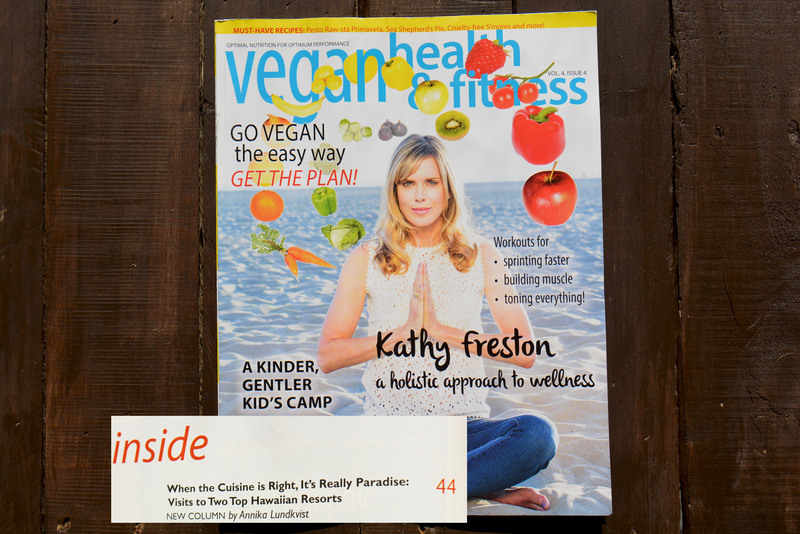 During my stay at the Fairmont Kea Lani in Wailea, Maui, I enjoyed experiencing all of the vegan options from the Lifestyle Cuisine Plus menu. Service at the award winning Kō Restaurant one sunny afternoon was friendly, genuine and exceptional, a feature of service I noted as consistent throughout our stay at both of Fairmont’s Hawaiian resorts. Breakfast we enjoyed in our room with a beautiful ocean view. The Tofu Scramble with Upcountry Vegetables was a favorite for me as were the lush Apple Macadamia Nut Pancakes which were beautifully executed, served with vegan butter and Vermont Maple Syrup. The one vegan desert I had during my stay at the Fairmont Kea Lani was exceptional. Moist and rich as well as simple and beautifully arranged, the Classic Rich Dark Chocolate Cake with Cocoa Powder Icing was a delicious way to round out my dining experiences at the Fairmont Kea Lani. When asked about the response to the vegan menu options at the Kea Lani, Public Relations Director Megan Hardesty noted that the response has been very positive and that “non vegan guests frequently order off the vegan menu,” Kō Restaurant’s Thai Coconut Curry being one of the most popular dishes. I observed that Maui has a very robust vegan scene, perhaps of all the Hawaiian Islands, and was curious if locals also enjoyed the offerings from the Lifestyle Cuisine Plus menu. Ms. Hardesty noted that indeed, about half of the diners that visit are local residents and many order off the Lifestyle Cuisine Plus menu. A few weeks later, experiencing another oceanfront Fairmont resort allowed for a whole new culinary experience, this time on the shores of the Big Island’s Kohala Coast. The Fairmont Orchid is stunningly placed and we enjoyed the amenities and comfort of the Gold Floor. Afternoon Tea and Sweets in the Lounge on our first day included a delicious vegan option of Grilled Upcountry Vegetables with Edamame Hummus Roll Up. Dining at Brown’s Beach House at the Orchid later that evening, we experienced superior service with a beautiful ocean and sunset view. I enjoyed the Crispy Sesame Tofu with Local Vegetables, Asparagus, Shiitake Mushrooms & Red Curry Sauce appetizer and for the main course followed the chef’s suggestion and savored the Mushroom Brown Rice & Quinoa with Beets & Hamakua Mushrooms, Wilted Kale, Enoki Chive Truffle Essence & Roasted Herb Oil. The following day, after a morning at the resort’s private beach, we enjoyed the Macadamia Nut Hummus with Local Vegetables at the oceanfront Hale Kai restaurant. I returned to Brown’s Beach House later that evening to be treated to a stellar vegan dessert, the Chocolate Mousse with Chocolate Cake Crumbles & Raspberry Sauce. The culinary highlight of my trip was a dish in which everything but the lentils was locally sourced, the presentation exquisite and the savory blend of flavors satisfying and invigorating. The Lentils Braised in Coconut Milk with Hamakua Alii Mushroom, Choi Sum, Kabocha Pumpkin, Pea Shoots & Lemongrass in a Lime Coconut Sauce was easily one of my favorite dishes experienced during my stay at the Orchid, which speaks volumes as I genuinely enjoyed every dish. The refinement and growth of gourmet vegan cuisine at luxury hotels and resorts is a development to be celebrated on many fronts, notably culinary, health and hospitality front. Here’s to delicious vegan culinary travels and experiences! Stay tuned for more! Aloha from Hawai’i for now.